Our company holds a vast experience in this domain and is involved in presenting an enormous quality range of Single Seater Kayak to our prestigious customers. This Single Seater Kayak is manufactured with utmost precision utilizing utmost quality raw material and ultra-modern technology in order to set industrial standard. We are one of the most reliable companies in this domain and are into offering Kayaks. HDPE Kayaks. High Density Polyethylene Kayaks. Price starting from 28000. Single, Double and Triple Seater HDPE Kayaks available from 28000 onwards. Ergonomic seat wells with adjustable kayak seat and adjustable leg brace to accommodate even tall person. External back storage with bungee cord to secure items. Single Kayak handle with bungee cord to fasten oars. 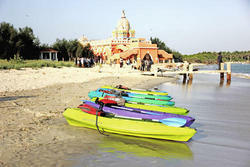 We are a top-notch organization, engaged in offering Single Seater Kayak . Kayaking / Canoeing is a sport for all ages. It requires no complicated equipment. All you need is a paddle and a lifejacket and you will soon enjoy paddling with simple instructions. We have 1- 2 – 3 seater kayaks and various sizes and types to suit your requirement.